Mohammed Raei, Ph.D. is a 2018 graduate of the PHD Program in Leadership and Change at Antioch University. Dr. Raei at his Dissertation Defense. 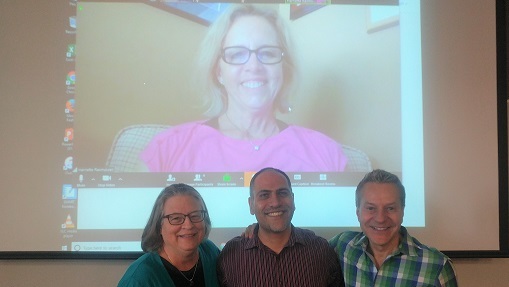 L-R: Dr. Carol Baron, Committee Member, Dr. Harriette Thurber Rasmussen, attending virtually on monitor, Committee Member, Dr. Mitchell Kusy, Committee Chair. Dr. Raei consulted on strategic planning, (co)facilitated a workshop on trust, facilitated several workshops on immunity to change, and several gatherings, meetings, retreats, and team buildings for a variety of clients. 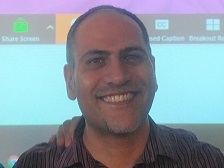 Mohammed served as a board member and programming chair for the Pacific Northwest Organizational Development Network where he developed many new programs. Prior to this, he worked in the marketing of dairy products in the Jordanian market for several years where he also led the efforts for ISO 9000 quality management certification. Additionally, he represented the dairy and food industries on several national standards committees (in Jordan). Afterward, Mohammed represented several multinational industrial goods companies in the Middle Eastern market. He has a Masters degree in Management and Leadership from Antioch University and has a bachelor’s degree in Industrial Engineering from Northeastern University. Raei, Mohammed, "Development and Validation of the Adaptive Leadership with Authority Scale" (2018). Dissertations & Theses. 446.